Anna Camner, Untitled, 2012. Oil on board, 34 x 38 cm. Faggionato Fine Arts is pleased to announce the first solo exhibition in the UK of new paintings by the Swedish artist Anna Camner. The show titled Dust, Dirt and Dingy Weeds builds upon the recent success Camner has achieved exhibiting internationally in Europe and America. On the outskirts of Stockholm, Sweden, Camner’s childhood home became the arena from which she began to explore the wonders of the natural world. It is these experiences that sowed the seeds and continue to inform her representation of the magic central to her childhood. She noticed that as winter gave way to spring, and the blossoms and leaves of summer were addressed by the autumn fall, that vital to this cycle was the decay of beauty. In this context, the animistic interpretation of the natural environment is almost impossible to avoid. Camner’s paintings are neither purely botanical nor fantastical, not wholly naturalistic and yet not completely symbolic. 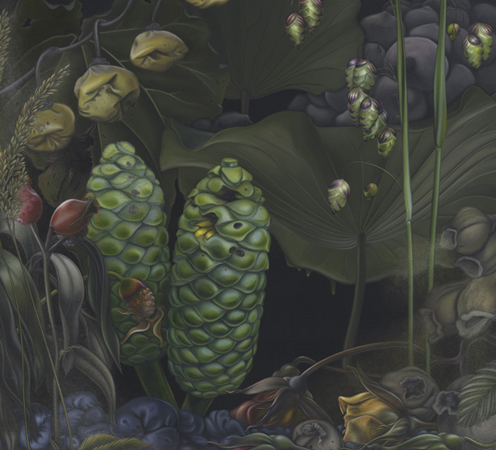 Her paintings evoke the uncomfortable world of fables, mythology, and the surreal distanced just far enough from the objective verisimilitude of traditional still life or landscape painting. There is a curious synthesis to her labour, a belief that things can be brought to life by the paint that re-presents them. Painting in oil on board, Camner primes it in solid black, graduating the background in a hue of pale blue, with the timbre of dawn locked in yellow or the illumination of night with purple tints on charcoal. The illusion of space is complimented by a polished rendering of light and dark. This embosses the organic temperament of the scene, focussing the viewer’s attention on the details of her subject, willing us to accept the world in which she has invested her emotional and spiritual travails. Philosophically, these small, intense, and elegant paintings deal with a breadth of subjects. But there is one symbolic association in Camner’s rendering of decay. The forms that arise from this cyclical event appear as discarded scraps of mammalian body tissue. Severed from the body beyond recourse, de-figurised, one could be forgiven for seeing a frontal lobe growing like fungus from out of the base of a leaf or the sinews of our collective nervous system draped over the junction of a branch. Here Camner sets to work to indict matter in general, playing with the building blocks of life with an absurdist’s imaginative touch. Born in 1977, Anna Camner received her MFA from The Royal Academy of Art in Stockholm in 2003. Her works are included in a number of prominent private and public collections, such as the Magasin 3, Stockholm Konsthall and The National Art Council in Sweden. Anna Camner lives and works in Stockholm. For further information or images please contact Faggionato Fine Arts at 02074097979 or info [​at​] faggionato.com.